A dilapidated two bedroom, timber clad, 1920’s heritage listed home in Sydney's Crows Nest was in desperate need of saving. Its life for the past 10 years had been home to squatters and the homeless. Situated close to the city, cafes and schools the new owners believed it had great potential to be transformed/renovated into their magnificent family home. As this home was to be their “forever” one; and with young girls leading into their pre teen years this space had to cater to the family’s busy lifestyle & had to do justice to the heritage of the old and the proposed modern architecture for the rear extension. Therefore with walls crumbling and covered in graffiti this family of four took it on and looked forward to the houses transformation with bated breath. In return they saw an ugly ducking totally transform in to a swan. A luxurious beautiful bathroom that is connected with parents master space, room to function as a wet area, dressing & make up zone. A space for two to share. 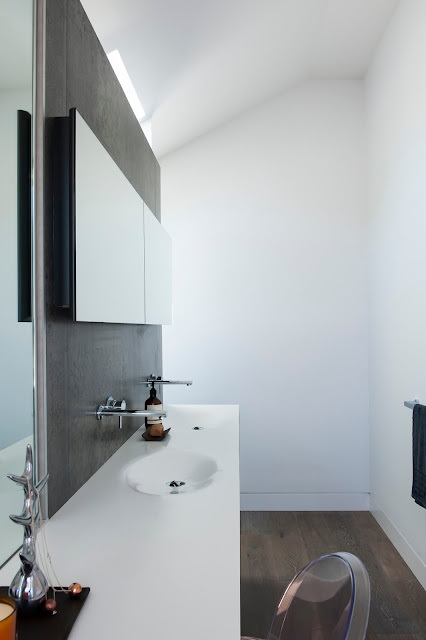 · Vanity to offer double basin, preference not to see plumbing below. The challenges of this space where many, the space is narrow, the client wanted a lot into a spall space, the sloping ceiling also reduced the usable floor space to one long run of the room. The designer chose to create a centre blade wall, this wall divides the room and fulfils many aspects of the clients brief; this centre wall creates two access points on each end of the wall, one access to the now concealed toilet area and the other walks into the double shower. 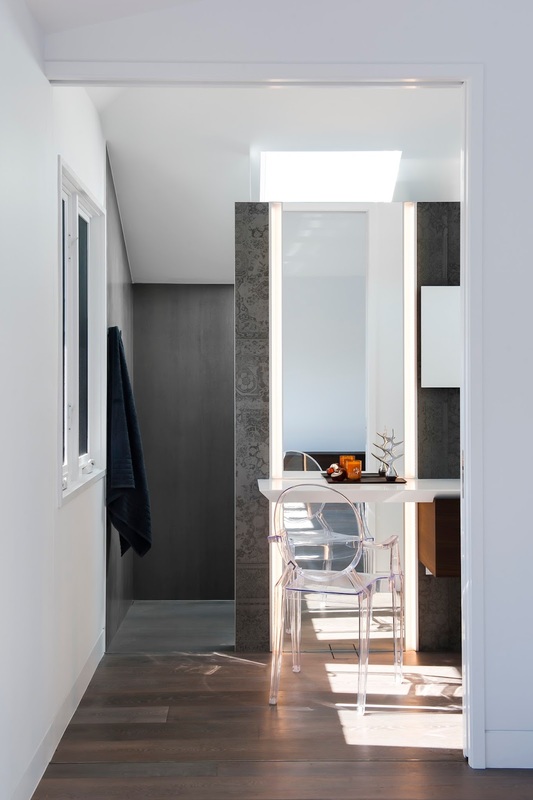 The ingenious solution of the design was to rotate the showerhead to the (longer) length of the wall rather than the short (narrow) side of the shower wall, as this is what makes this space feel larger than it actually is. 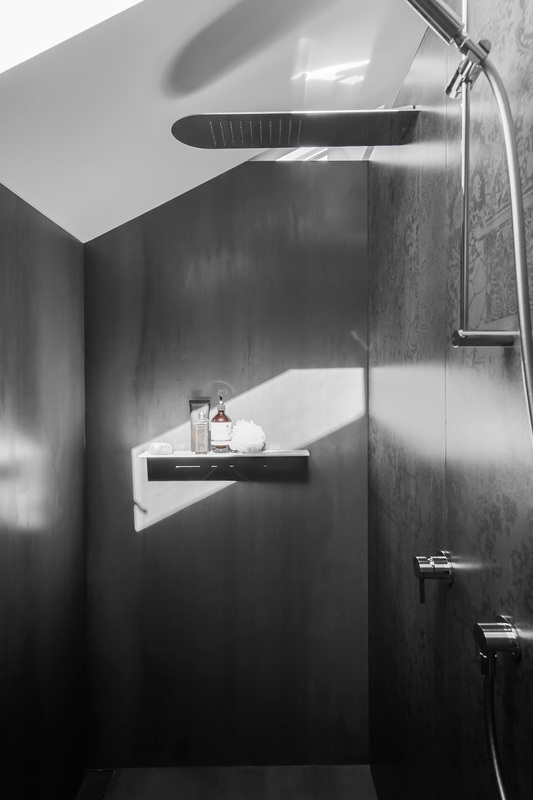 When we address a shower we stand front or back on, so it makes a lot of sense to have the water sources on the longest wall – hence making the shower feel bigger. With the bathing and toilet taken care of it came down to the vanity wall, the designer chose to create three balanced spaces, two thirds to be given to the custom made solid surface washbasin and one third to the dressing or make up area. The lighting as usual plays a big role, especially when make up is involved. The designer created a concealed LED light source with reflectors so when sitting at the make up area the face is perfectly illuminated from both sides and by selected LED lights with CRI (Colour Render Index) output of 90 it meant colour is reproduced almost perfectly. 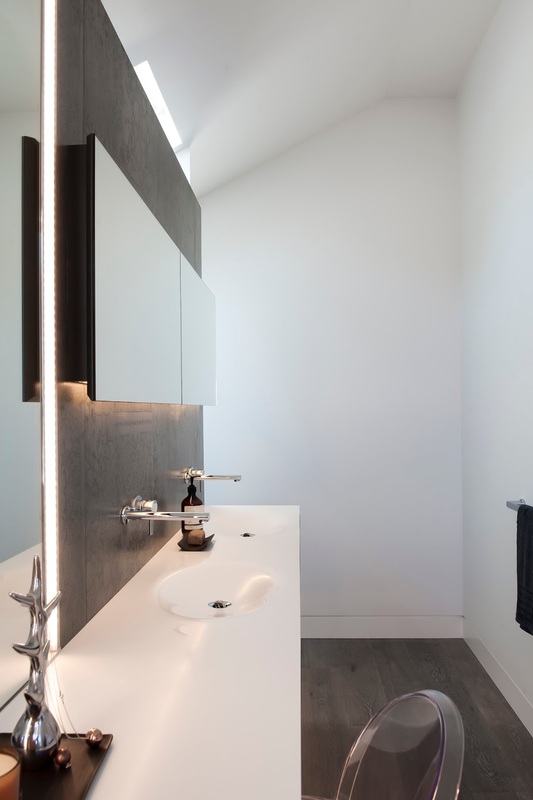 As it is a small room, one 14.4 watt high out put LED light on top of the centre wall offers all the room light this small space requires, low energy efficient LED downlights over the basin provide a little extra facial illumination for shaving and so on. 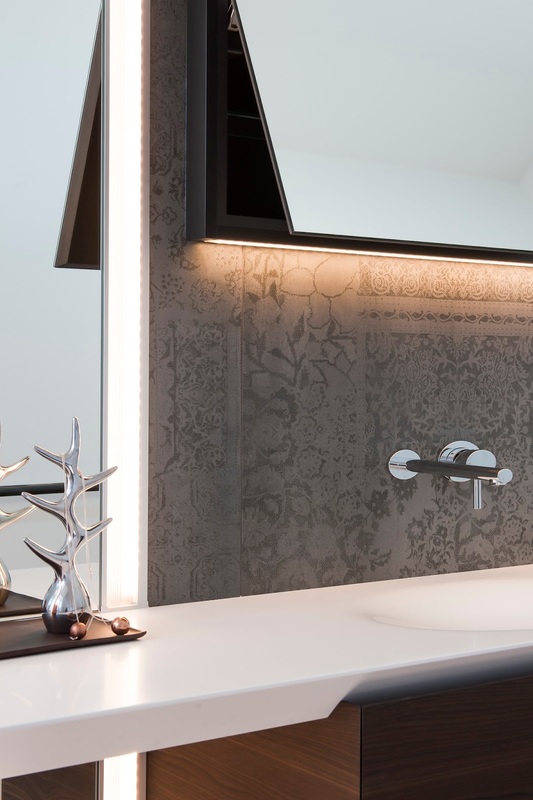 A sensor light under the vanity & under the recess wall cabinets provides a low out put of light for the midnight dash. 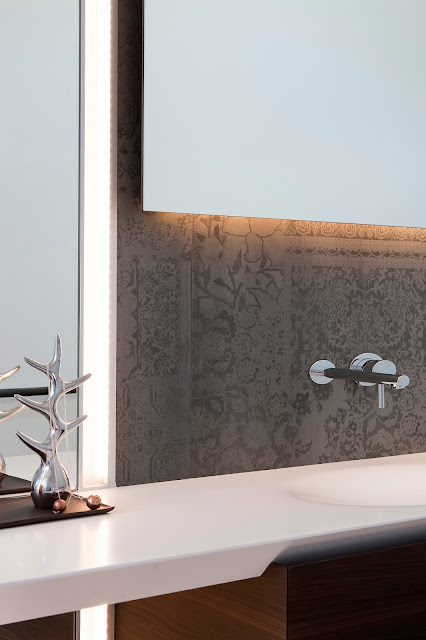 The materials are always the last element selected; connection to the other spaces the designer created for this client was important. Large format tiles 3000mm x 1000mm are applied to all walls and the floor of the shower and toilet. The engineered timber floor from the bedroom runs thru and under the vanity connecting the bedroom to the space thru the floor and a large oversized sliding door. 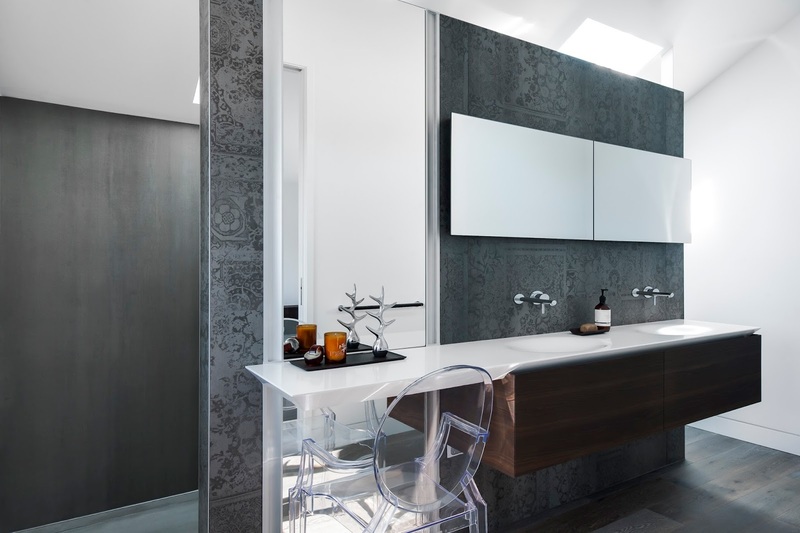 This space has created a private retreat for the owners of this stunning property, a space where they can both function, rejuvenate or get ready for the busy day ahead. Understated elegance creates a stunning bathroom.